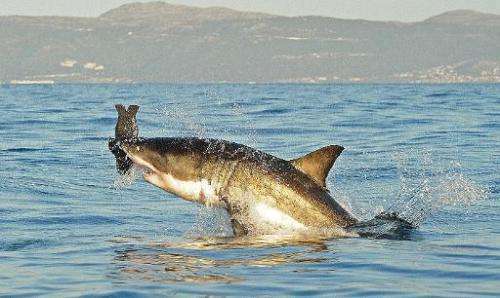 Great white sharks are likely rising in numbers off the coast of California and are not at risk of extinction despite some reports to the contrary, US researchers said Monday. "If something is wrong with the largest, most powerful group in the sea, then something is wrong with the sea, so it's a relief to find they're in good shape," said George Burgess, director of the Florida Program for Shark Research. "That we found these sharks are doing OK, better than OK, is a real positive in light of the fact that other shark populations are not necessarily doing as well," said Burgess, a co-founder of the Shark Specialist Group of the International Union for the Conservation of Nature. The earlier count was based on research at two sites—the Farallon Islands west of San Francisco, and nearby Tomales Point—where seals congregate and so do the sharks that eat them.